The Dream House 'Seahorse' is located in close proximity Baltic Sea (to the beach is about 300 m). The Dream House "Starfish" was rebuilt in traditional style with thatched roof. 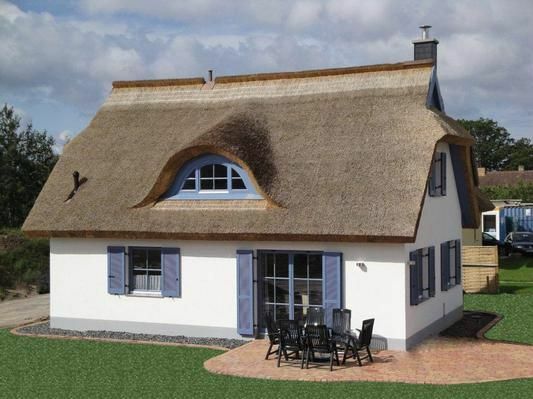 It is a very tastefully decorated Thatched with a floor space of 100 m² on a 550 sq m site. The Dream House "Starfish" has a large terrace with direct access to the living room with fireplace and underfloor heating. The equipment of the house is with kitchen, 2 bathrooms (upstairs - shower, toilet, downstairs - sauna, shower, toilet), with 2 bedrooms each with two beds, 2 parking spaces in front of the house. The Dream House is a Non smoking home - pets are always welcome. A dream holiday home with pure joy living to relax and dream. This house offers you the opportunity, regardless of the season to spend an individual holiday. Cost of electricity (0.35 EUR per kWh) and water (8.00 EUR per cubic meter) and gas heating (1.10 € / m³) are charged according to consumption (Prices subject to change). Bed and bath linens, firewood can be ordered on request. 150, - € deposit to be paid in advance and will be charged with additional costs. A parking lot near the house is available. "In the main travel time 10. 5.-31. 10. 2017 and 20. 12. 2017-05. 01. 2018 only weekly rental possible with arrival Saturdays. Deviations from this 4 weeks before arrival on request. " Linen (once per person, available 10 EUR). Towels (one per person, available 8 EUR). Pets (per property per day, included 5 EUR). Internet (per object and day, included in the price 0 EUR). Firewood (once per person Available 12 EUR). Tourist tax (per person per day, perform 1 EUR by the tenant). Tourist tax (per person per day, perform 1 EUR by the tenant). Tourist tax (per person per day, by the tenant 1. 5 EUR). Tourist tax (per person per day, by the tenant 1. 5 EUR). Parking (per object and day, included in the price 0 EUR). Sauna (per object and day, included in the price 0 EUR).